The Grand Mesa, Uncompaghre, and Gunnison National Forests 1996 PIT project was a resounding success. Volunteers helped conduct oral interviews to document the history, stories, and lifestyles of local ranching, logging, and mining families that settled this area in the late 1880s. The original settlers are no longer with us, but many second-generation family members remain in the area. The goal of this project was to document family and community histories, many of which have never been recorded and which are in danger of being lost. With the help of PIT volunteers, descendants like Leonard and Helen Burch of Olathe, Colorado (see photograph) were interviewed; as a result, we have been able to preserve the wonderful stories and some of the history of the area. Volunteers interviewed descendants of the original settlers about their family histories in the Oral Histories project at Grand Mesa, Uncompaghre, and Gunnison National Forests. 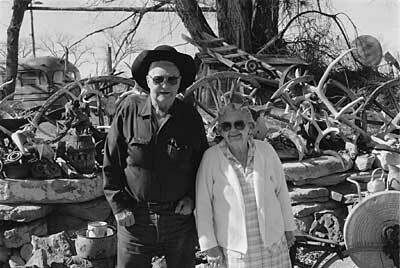 Here, Leonard and Helen Burch of Olathe, Colorado, stand in front of a mound of miscellaneous objects collected by their family since the late 1930s.